Our November Brava meeting was this morning. It’s usually the last Friday of every month, but due to the Thanksgiving holiday, we scheduled it a week early. It is rare that we ever miss a month altogether. Our meeting was at the studio of Carol Cleere. Check out her incredibly magical work. 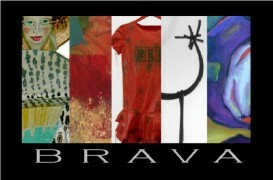 And if you haven’t looked lately, you might enjoy the other links at the Brava blog. See you tomorrow for Saturday Finds! I will vivit Brava Blog!